Canon ready to ship hot new D-SLR camera? Will the Canon 1D Mark III have a friend next week? Although Canon has run into some issues with its autofocus lenses as of late, the company is still pumping out some of the best digital cameras on the market. And in an attempt to bolster its line-up and make it even more difficult for Nikon and others to compete, a recent rumour suggests an as-yet unannounced D-SLR may be in the works. 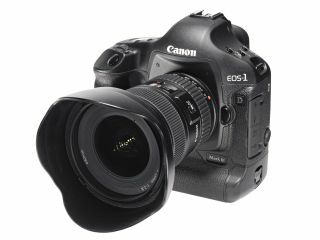 Dubbed the EOS-3D, Canon's newest entrant could fill a void in the company's line of SLRs between its entry-level Digital Rebel XTi and the high-end 1D Mark III, according to reports. It's rumoured that the new camera will sport a 15.1-megapixel sensor and include many of the image quality features currently found in top-of-the-line models: 14-bit colour processing, a 3-inch screen and a complex autofocus system. Ironically, the camera could also boast even greater ISO sensitivity than the 1D Mark III, with a possible ISO 6400 compared to the Mark III's ISO 3200. The report also suggests that the ISO sensitivity could be bumped up to an astounding ISO 12800 with the help of a special extension. So far, Canon has neither confirmed nor denied the rumour, but speculation abounds that we could be seeing this camera unveiled at the PMA photography expo next week.